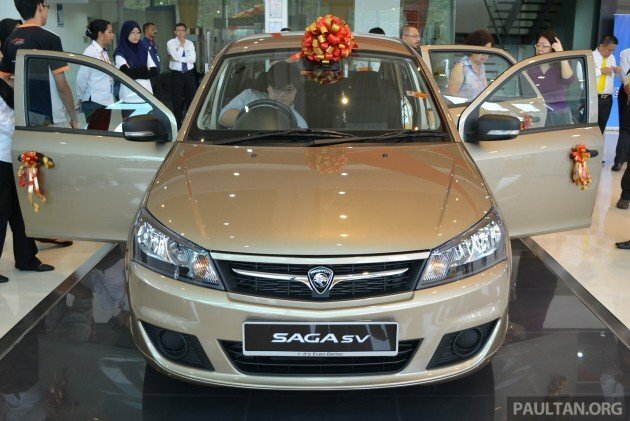 Proton Edar expects to sell at least 4,000 units of the Proton Saga SV yearly in Sabah, reports Bernama. According to Edar CEO Hisham Othman, nearly 1,000 bookings have been recorded for the car in the East Malaysian state. The nationwide booking count has now surpassed 8,000 (up from 6,000 late last month), around half of which are expected to translate into sales. Hisham said this exceeded expectation, considering the entry-level Saga variant has only officially been on the market for three weeks. “You can own this car for as low as RM280 monthly payment (in Sabah),” he said. Bernama also reports that neighbouring Sarawak is expected to contribute a significant market share for the Proton Saga SV. “Our previous sales trend showed Proton Saga sales of all variants accounted for 15% of Proton sales in Sarawak,” the national news agency quoted Hisham as saying. He also said the company was trying to reduce the price gap between East Malaysia and the peninsular. Consumers in Sabah and Sarawak have to bear an additional RM3,000 in freight costs, which include storage, shipping, transportation and insurance. The national carmaker has 12 outlets in Sabah and 13 in Sarawak. The Proton Saga SV is sold at a starting price of RM36,138 in both East Malaysian states. Very good. Who supported you? Majority of your supporters buy Toyotas & Mercedes, or Proton? Think about it. Think about your rakyats, they are your anaks. The sales is not up to expectation is it? Why they need to shout about this every week if the acceptance level is high? What is the smallest price gap between East and West among all new cars sold in Malaysia? Why bother buying saga sv as it is not safe. Go buy VW. Then you can be successful as me and become keyboard warriors. *PUKE* Successful as being pondan !!! jangan takabur la bro.. bukan semua orang kaya like you smpai dpat beli VW.. haiyaa..
cheap because low quality.. plotong always low quality.. only poor people will buy plotong.. if u got money better buy vios..
u want cheap & high quality??? should be : quality at correct price..
brainless indons like you hard to understand..
Apelah..sekurangnye2 ade org takde kete kat sane bole dh ade kete nk keluar pergi mane2..kire baguslah proton tolong rakyat yang kurang berkemampuan..siap dh ade airbag..bawak kete semahal n selamat mane pon bole accident jgk..hadoi..gud job proto teruskn lagi…commited to better..
got no money baik bawa basikal..
yea, u and ur dugong vios! I agreed your view from a certain angle but I think you miss the point, because of proton we can’t afford other so called imported car with much much lower price. Because of proton we force to buy local car with (a) Milo tin kind of quality (b) Low price with low spec (mind you they should have include in the air bags long2 time ago not NOW only bundle with their stupid SV models!! ah ko…proton tolong rakyat… proton tolong rakyat…kaple auntie ko…kreta local pun ade excise duty, patutnya utk local tak payah kene duty supaya kreta local lagi murah & supposely to be affordable for all rakyat, not making the less fortunate more burden…mmg kete semahal n selamat pon boleh accident tapi fikir lah quality…impact sikit pon jadi macam sayur kobis dah ape lagi kalau impact yang kuat…meninggal terus…good job proton pak cik kau lah ! lu pikir lah sendiri assalamualaikum…. Ye la. … design sendiri la, mencipta nama di persada dunia la, …. Even with all these syok sendiri term, the product still a crap. still better than talk kok only.. like amoi..
Talk about tok kok. That’s Proton’s specialty. 2. Wah! Lucky I didn’t book the other model. 4. Aim to regain no 1 spot in 2015, 2016, 2017 …. ntah bila. 6. Pesaing kita yang kecil telah menjadi besar. Proton bila lagi? i hv to agree with u selena. this is really good job. all the best proton! 8000+ bookings within 20 days. 8000+ bookings, after educating them 7999+ cancel their bookings. the one and only hard head donkey left is gotta be you. enjoy your SV sir ! ya ya ya bla bla bla we welcome 8000+ proton bashers to come in the future.. good good later we going to have more people in our side.. buy buy.. bashers have nothing to do with their money.. Ask Malaysia Government to enforce the UN R94 & R95 regulation first. Then we can see which car don’t comply the requirement. Want a VW, then earn a VW. Bro bvc100. The problem is, we all can own a VW but what had the govt done to us? nope.. u’re wrong.. mostly u can see Saga everywhere in sarawak.. just a few hilux on the road. true, hilux/4wd is everywhere whenever u set yr foot in northern and central region-EVERYWHERE & NO BS guarantee. don’t ask me to check,i live here! u’ll only see saga mostly in southern region which came here for few recent f*-in’ years.if perutdua got itself cheaper price,saga will be the Unbelievable to purchase.but,it’s better to have a car than a bicycle,no ? suit yrself. good God,help proton or whatever they named it. high-way fun fact: have you ever enjoy ocean’s wave on the land,dude ? come here,we’ll show u.there are more to feel than meets the eye. We are supposed to be high-income developed nation by 2018 (in today’s news). But why is our so called National Car company still producing 3rd world quality cars? People have been complaining about awful proton and f**ked-up excise duties for 28 years. 28 YEARS!!! Many many years already lor, complain so much until vomit blood already still complain. But complain for what? Proton and govt won’t care. They won’t give a sh*t. One ear in the other ear out. For 28 years they have been doing that, one ear in the other ear out. Yell and complain and rally until tahi habis keluar also no use one la… proton and govt are numb up there. So how? Just don’t buy Proton at all lor. To make a change you must first change. One fine day proton zero sales, see what they’ll do. Then buy what? Don’t buy. Keep driving your current car until the day Proton gets zero sales. Then maybe the govt will do something hopefully for the better and not increase excise duties to 1000%. For those got no car at all just get 2nd hand car lor. Buy from direct owner, not from second hand dealer. 2nd hand dealer also another one, cutthroat cheaters. Then some people think, wa… Malaysia boleh. Proton reduce price so more people can buy car means Proton cares. For those people, ignore them la. Govt send angkasawan to space means Malaysia boleh, what a joke. I got RM20mil also I can go to space la. What i’ve said would tick off some of you. You want to flame me, ridicule me just go ahead la. Whatever makes you happy. Really no eye see. Yes, Proton is poor man’s car. What to do, we are all short changed by the government. To point an accusing finfer at Dr. M also won’t help because he is not driving a Proton. At this price, it’s affordable no doubt. I bought a 1.5 l saga back in 1991, it cost me RM31K. So RM36K after so many years is reasonable. Quality wise, I still have hang over from my second Proton which is a Waja. From then on, I vowed not to buy a Proton again. hmmm… i was wondering the 8000++ unit order is becoz the Hari Raya is near??? need new car to balik kampung??? Proton knows that rakyat sure buy their low quality product no matter lots of defects and poor after sales service because of tax structure that favour them all this years. Thats the confidence makes Proton survive till today. In Europe 75hp or even 60hp cars are still popular. For instance in Italy “L”-Drivers are not allowed to drive cars with more than 80hp. Europe lagi. Sikit sikit Europe, sikit sikit BMW. European car’s quality are top notch. Proton bila lagi? See the look of the guy behind the wheel!!! Looks like he is behind a wheel of a Porsche..
Sell in malaysia…..always expensive but when sell to other market…..cheaper with better specs and better quality…WHY????? Hey where is my comment I posted the other day? Why Paul tan did not publish it???? Saga SV, then Saga HV ” high value” and after 6 month each Saga has an end.. DRB must look at proton different than the CKD factories they have. Let proton do their R&D and work not force them to cut cost if u want to go global. Let them get proper entering partners to work with and stop the proton staff exodus to other companies. Toyota is the best !!! Toyota got problem,honda got problem,merc got problem,bm got problem,VW got problem all this big2 name more than a decade in business but still got problem…but when potong got problem walauweh kecoh satu dunia….poor malaysian thinking. ignore about the quality ..
of lower income group to buy their first car. I like proton because of its handling….4 me its superb..all tq to lotus…gud move from proton….for a 40k-50k++ car its gud in handling side….when u tweak ur proton car handling..it become more superb….but all tanggung sendiri la if xcidwnt or what…hahaha….should build body like a tank…for me..if u like good handling car…u can buy proton..if not…but other imported brand..ok chiow….